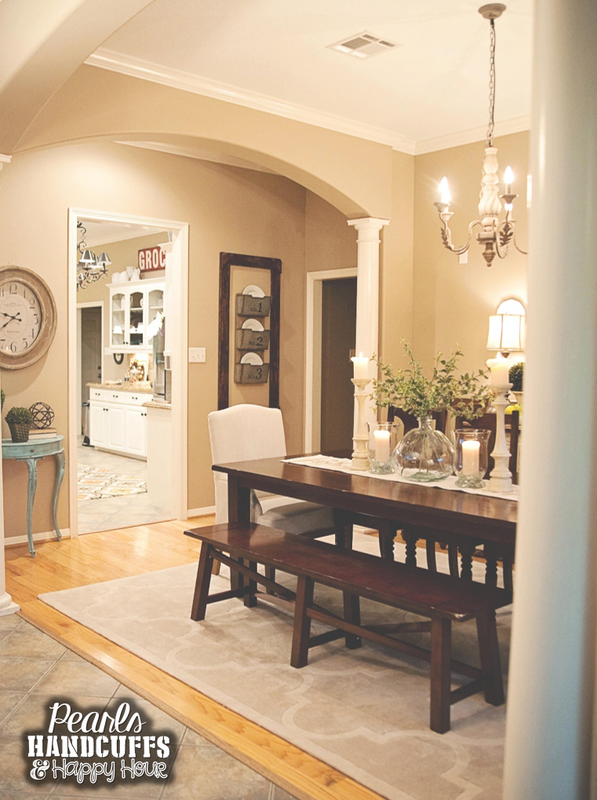 Welcome to Home Tour Tuesday! It's still a bit of a work in progress. I need to move the plates over to the right...I'd love a few more textured chairs to replace the wood ones...I'm thinking about making the plate display bigger or adding something on either side?!?! That's what's in store next for this little room. Ideas? 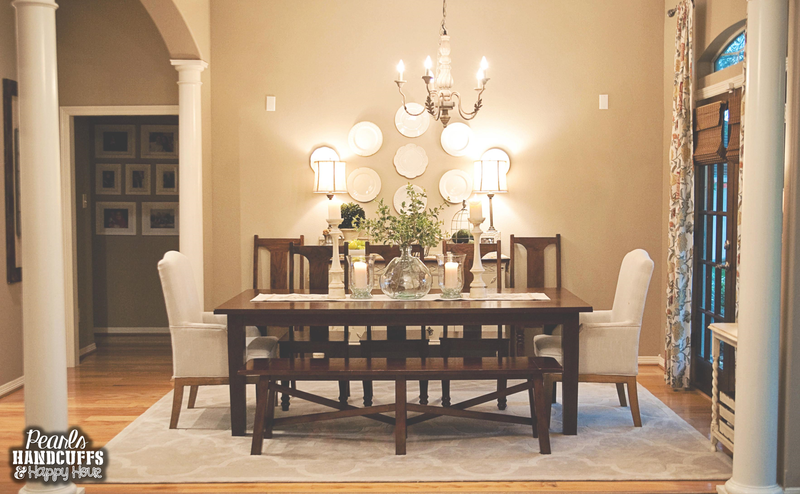 You'll notice that the chandelier is slightly askew and NOTHING in this room is centered. The chandelier story is one we'll laugh about in the years to come, but the wounds are too fresh to rehash right now. Let me just tell you that I don't say I-told-you-so very often, but it was absolutely necessary during the installment process. 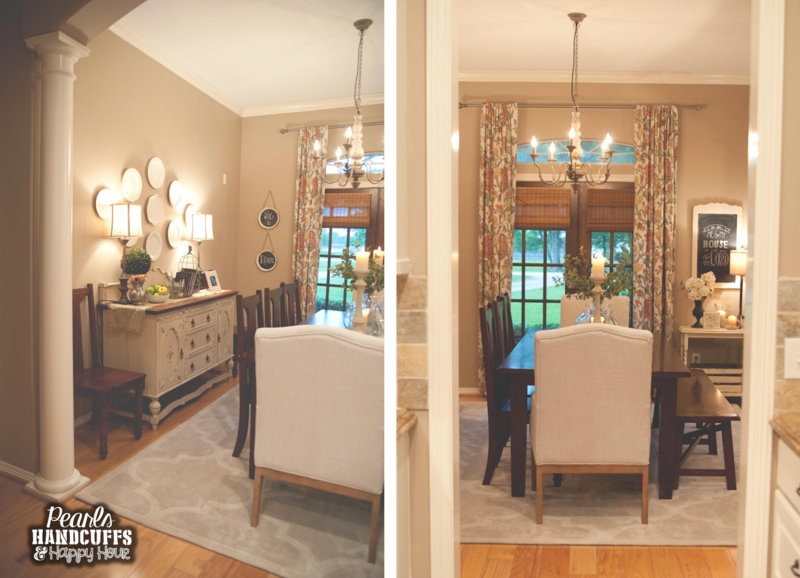 The dining room is the first room you see (to the right) when you walk in the house. You can see the kitchen from the dining room and in the little hallway off to the left is the guest room, boy's room, and jack-and-jill bathroom. This is my view when I'm standing in the kitchen. Like I said, don't pay too much attention to the chandelier. The fact that the wire wasn't woven into the chain is driving me batty right about now. Those little chalkboard plates hanging from the wall in the left corner are a bit too small for the space. I threw them up there a couple of weeks ago to try them out and I'm still not feelin' it. I found them at Marshall's back in January. I'd love to find a neat set of botanical prints...or maybe even bird prints...to put there. I even thought about chicken wire baskets filled with old book pages and cotton bolls. Ideas?!?!?! When my handy husband was installing said chandelier, he thought putting a step stool on top of the table would be a good idea (even though I BEGGED him to get it off for fear that he'd fall off and break his neck). Like any confident man would do, he ignored the woeful pleas of his better half and well...he fell right off the step stool and onto the floor from the top of the table. I freaked my freak. I thought I'd be calling 911. It banged up the front of my buffet pretty good and the table and one of my chairs are dinged up, too. He swears he cracked a rib. He's just now starting to feel better and it was installed over a month ago. Needless to say, he won't be doing that again any time soon :) (Is this a bad time to say I-told-you-so?!?!?!) In more serious news, I am SO happy he wasn't injured badly!!!! I would've lost my mind!!!! The buffet decor is pretty minimal. Just the way I like it. To the left sits a bowl of green apples, an antique pewter pitcher filled with my wedding bouquet, and a topiary. The pewter pitcher was a wedding gift from Adam's late grandma. We just adored her and love displaying something so special as a reminder of her in the house. The topiary was from Marshall's (about 2-3 months ago, but I still see them in store from time to time). The lamp bases are from Kirkland's (last year) and the shades were from another set of lamps I scored at Ross (in December). The wire basket (Home Goods) is filled with mason jars and my grandma's old silverware and books. The wire cage to the right was a $6 find at Kirkland's (January) and I think it's missing a base which is probably why I scored it so cheap! The frame is, of course, from Marshall's. 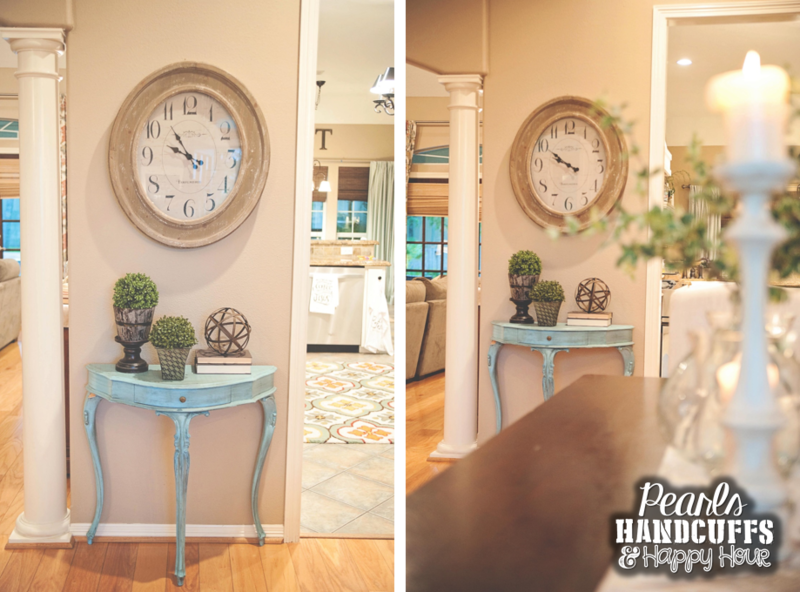 I added the linen table runner for more texture and love it. Moving back to the table, I never know what to do for a centerpiece. I go back and forth and it all feels like a hot mess. This is finally a set-up I really like. I've had this up for a couple of months and think I'll keep it for a while longer. Here's my view from the living room. See that tile in the entry?! I'm not a fan. It's a little out of place. It continues in the kitchen and I get that. But not so much in the entry. We'd like to have it replaced with wood in a herringbone pattern. Add that to our list of to-do's. The plates are all random finds from Marshall's/Home Goods/TJ Maxx/Ross. I've had them for several years. We had the chairs on either end of our table in our bedroom for about a year. 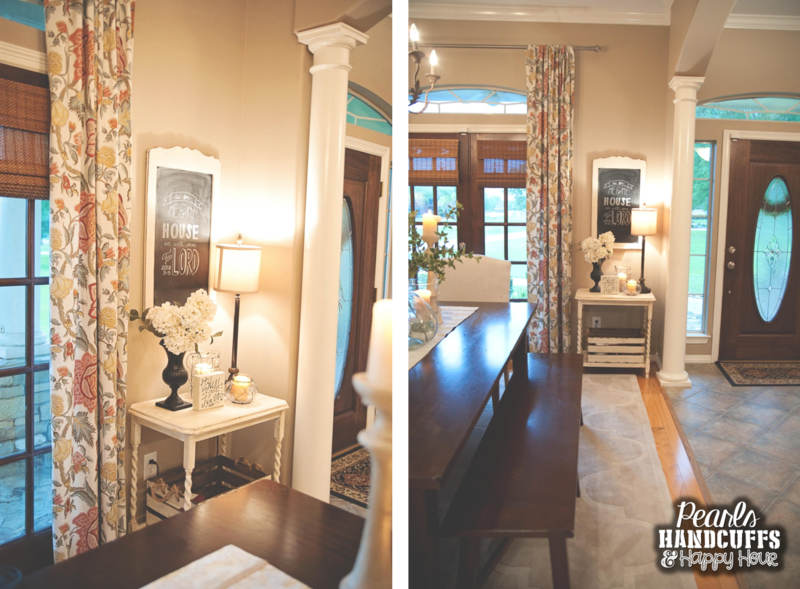 I've been wanting to add some different fabrics and textures to the dining room for a cozier feel and so we moved them out of the room to try them out. 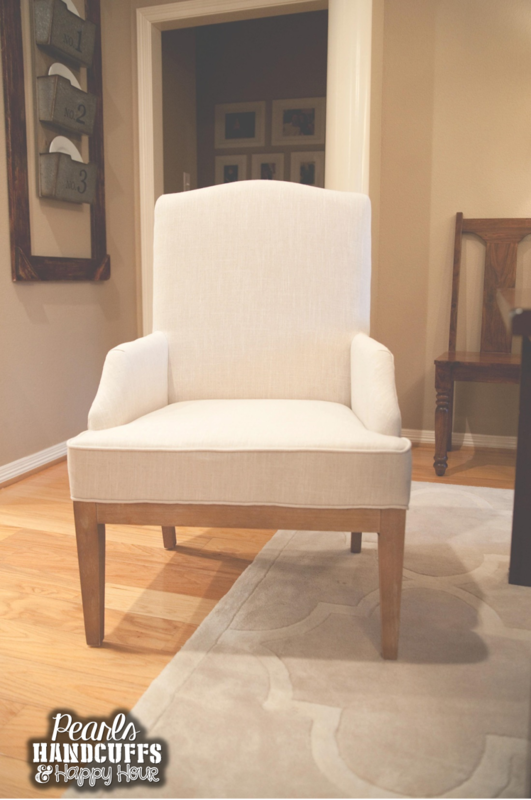 I loved the way they look, so they stayed :) My office is the big chair closest to the French doors and makes working so much more comfortable :) We found these at Marshall's last year. Here's a little view of the right side of the room looking toward the front of the house. I bought that little white table at an antique auction about 7-8 years ago. It's run the gammut of paint colors and antique white is the color it will stay for a long time to come. I love this cozy little corner. Since I work right next to the table, I keep my laptop, mouse, and cords in the crate. Easy and efficient storage. Love it. 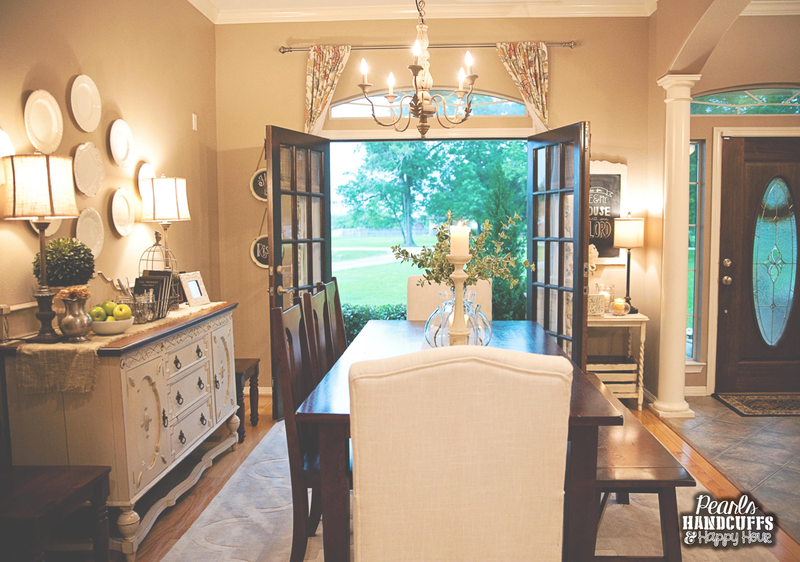 Here's a view of the dining room standing outside the French doors. A very, very crooked view. This little set-up is in the "hallway" which I consider part of my dining room. My family likes to joke that time always stands still in my house because not one of my clocks is working. I mean, they all work, I'm just #toolazy to put the batteries in. SAD. On the other side of the doorway next to the blue table is this little file display. That giant wood frame used to hold a huge piece of wrought iron. We found it when we lived in Dallas at a local trade days. We were sort of over all the iron, so Mr. Spouse removed it and then we hung the file inside. I'm still not 100% sure I loveit. The frame is a bit big for the small file. But I do love the file itself. 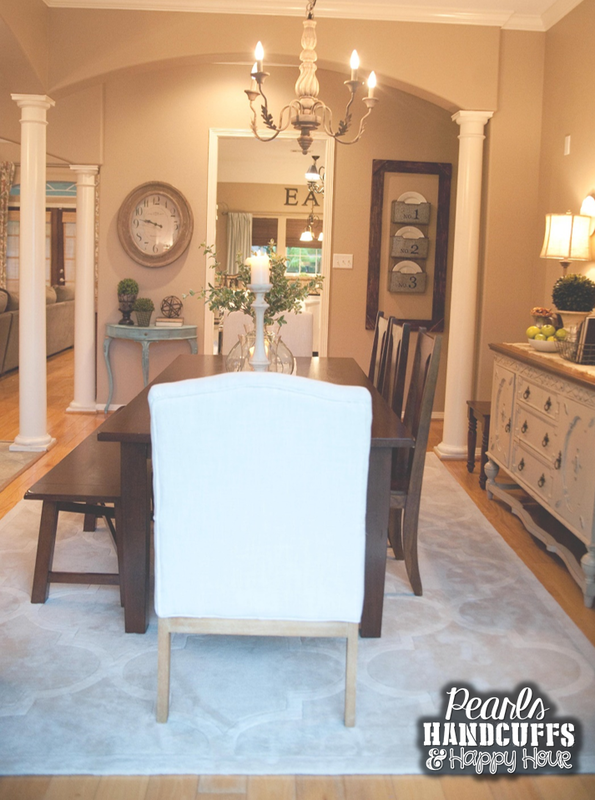 My favorite thing about this space is the French doors. I love that they open up and I will often keep them open when I'm working or on really cool days. I especially love to keep them open when it's raining outside. Not too sure where the tour is headed next week, but I'll be back to give you another peek next week! Tour the "Mystery Room", too!! Your house is just dreamy. Kirkland's is my absolute favorite store! I would love to go shopping with you- I love how you picked a color scheme and stuck with it! That's so sweet of you to say! It's taken me FOREVER to choose a color scheme and stick with it!!! 11 years and still counting! HA! It's so pretty! I love it!!! Ah your home is BEAUTIFUL! I almost just died when those french doors opened up. So gorgeous! 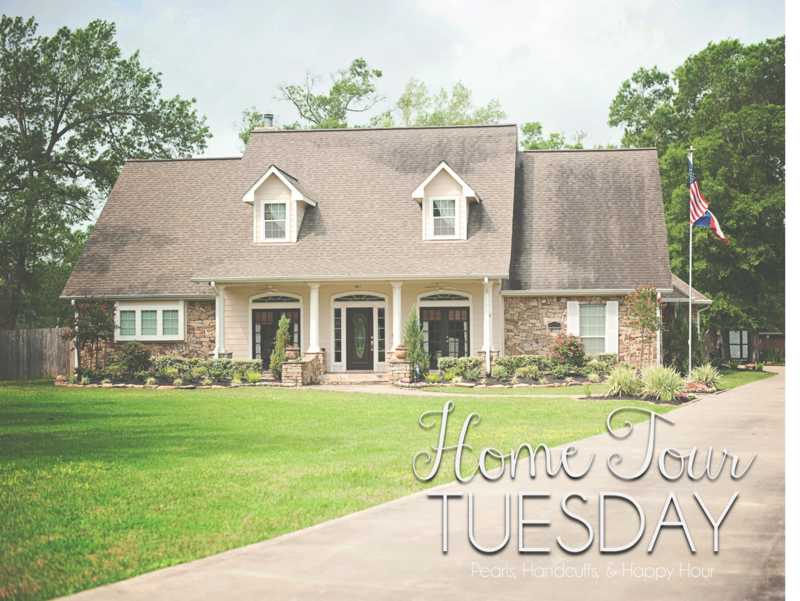 This is my first time popping into your "Home Tour Tuesday", and I'll definitely be back. 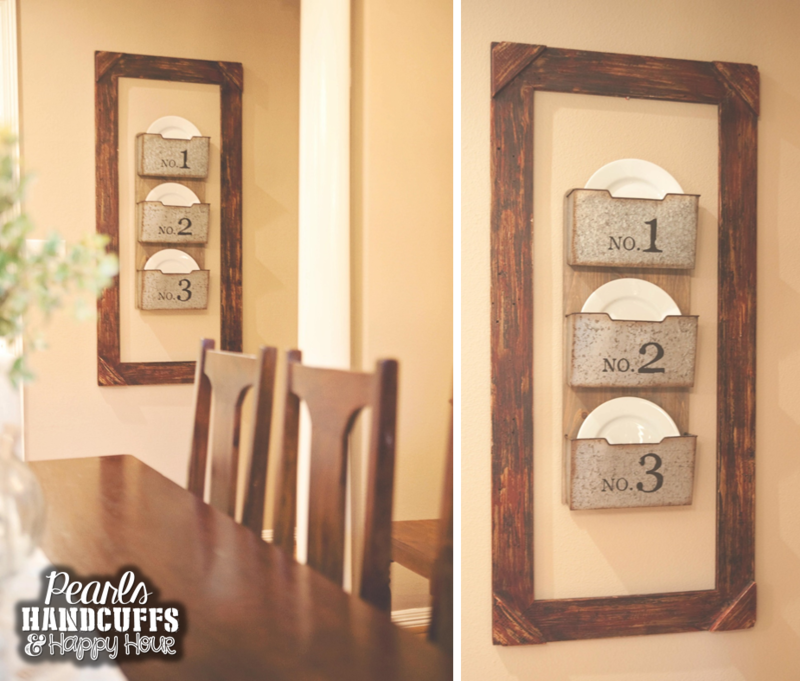 :) We're in the process of slowly sprucing up the home we bought in September, so I adore seeing how others decorate and make their homes their own. :) Thanks for sharing! Thank you! I love peeking in on everyone else's homes, too!! Lord knows I need all the help I can get!!!! 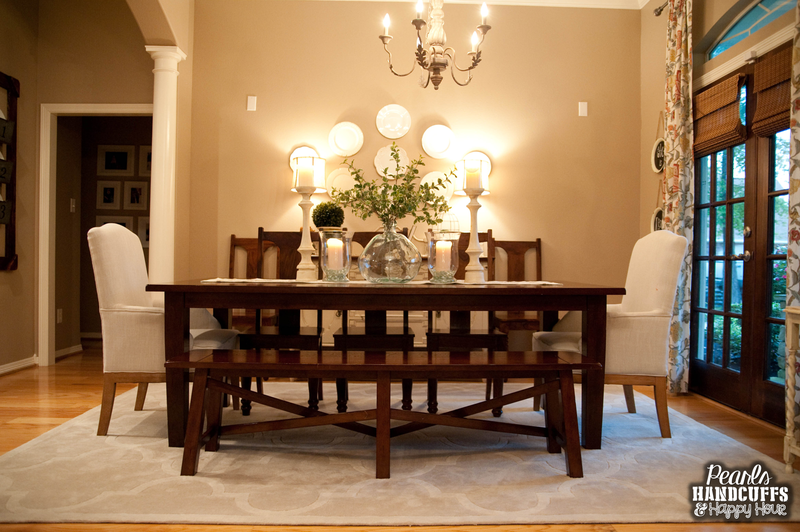 Beautiful dining room! Oh, my--I can just imagine the fall episode! Glad he is feeling better (and I bet he won't do that again!) BTW, I have that same rug in my living room--does it constantly send dust bunnies when you vacuum? I swear I won't have a rug left one of these days! Thanks, Jeanne! Let's pray he doesn't do that again!! HA!! ANd YES!!! The dust bunnies are constant!! I was reading the reviews and other people were saying the same thing, but eventually those dust bunnies are supposed to disappear. I'm glad it's not a high traffic area because I'm sure mine would be much worse!!! It's such a beautiful rug! This I beautiful! You have such and eye for details! I love all the little touch you have placed just so! I have zero ability when it comes to home decor. That's so sweet of you to say, Jenna!! Thank God for Pinterest because my eye for detail only goes so far! HA!!! I finally found my "style". My husband cracks up... He calls it "galvanized metal style". 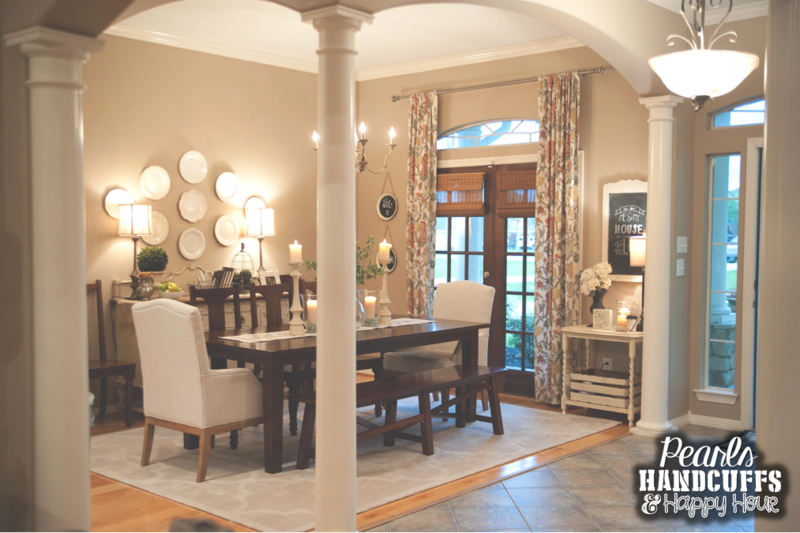 It's a little country chic and farmhouse with a touch of class. Your room is beautiful. The best decor by far... (At my house) are the little fingerprints my boys and baby girl leave on the windows. Always a place to raise a family. Great post!! 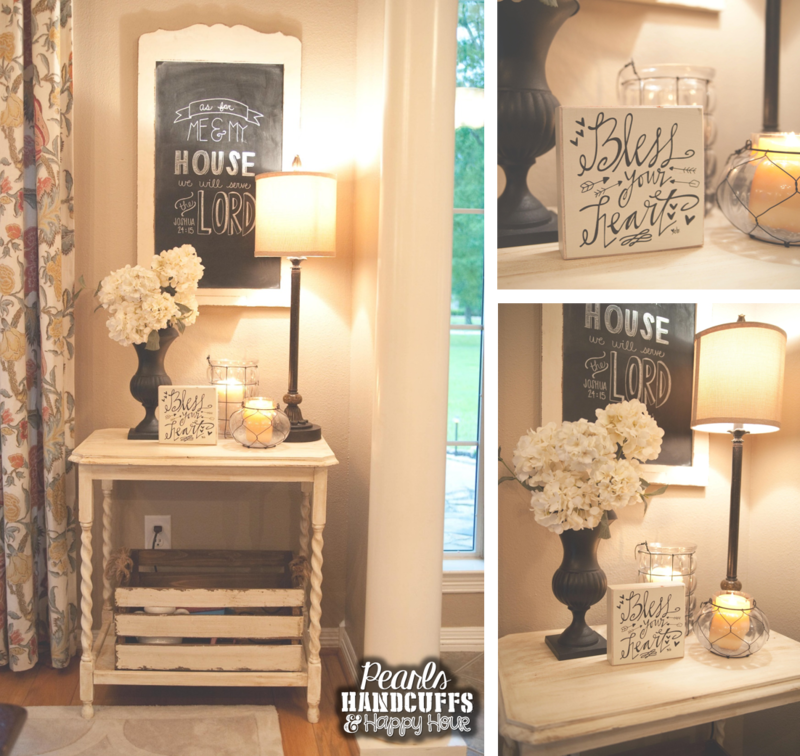 Oh my gosh I just love your house! You have a gift for decorating!!! 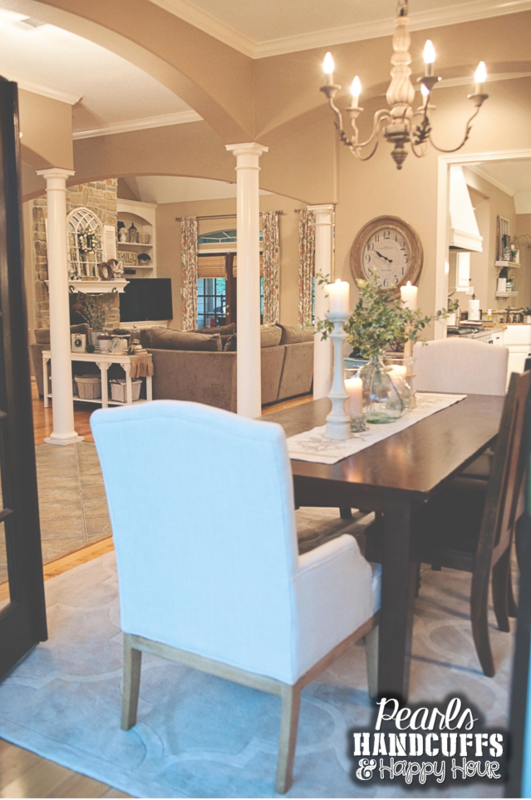 Beautiful space, and I love all the columns in your home. Thanks Renae! Those columns are still growing on me!!!! Thank you, Andrea!! And girl...PLEASE. Heck no. It's hardly EVER clean!!!! There are stuffed animals, books, papers, and shoes strewn all over the house at any given moment!!! HA!!! These pictures were taken the day after our housekeeper came to clean :) HA!! So, you can count on our house being almost spotless at least two times a month! Otherwise, it's a mess up in here!!! !